Pets Costs > How Much Does a Russian Tortoise Cost? How Much Does a Russian Tortoise Cost? Originating from Uzbekistan, the Russian Tortoise are the smallest known tortoise species available, essentially making them one of the most sought after turtle species at local pet stores. In the wild, these tortoises are commonly found along the edges of rocky hills or the deserts of Russia, Iran, Pakistan and Afghanistan. On average, most Russian tortoises are going to cost between $75 and $200, and the costs will depend on the age, size, health and seller. Baby tortoises will almost always be twice the amount of an older turtle. For example, a Russian tortoise costs $150 at PetSmart. Another pet supplier online, BackwaterReptiles.com, sells its Russian tortoise hatchlings for $200 or $70 for one that is four to five inches long. Tortoise Supply, another online pet retailer, sells its tortoises for $100 to $200. Males can grow up to eight inches long, and females, on average, tend to be two inches longer than their male counterparts. When healthy, hey can live up to 30 to 50 years in captivity. The Russian tortoise has a light brown and olive color shell with dark brown bands that wrap around the shell. 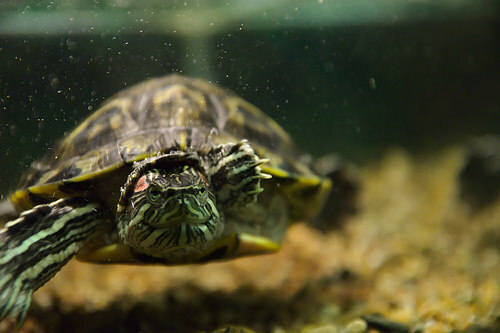 They are known to be very active for a turtle, friendly and tame when gently handling them. Housing, at a minimum, should be at least 36 inches long and 12 inches wide; however, the larger the cage is, the happier your tortoise can be. Aside from the indoor cage, an outdoor pen is also recommended when the weather is warm outside to allow your turtle to roam to receive its much-needed UV rays and should measure at least four by-four feet. A good cage can cost $125 to $200. For example, the best rated Russian tortoise tanks online retail for about $150 to $200. Inside of its indoor cage should be a hiding area, a dehumidifier if you live in a humid environment and a UV light, which should be kept on for 12 to 14 hours per day, to help it receive heat. The temperature should be kept at 75 to 85 degrees Fahrenheit. The bottom of its cage should be lined with a substrate, such as alfalfa pellets, at least one to two inches thick. As for its diet, they tend to eat just about any plants, fruits and vegetables, and experts recommend a high fiber, rich in calcium diet with as little as protein as possible ensure a good digestive tract function. Some of their favorite foods include romaine lettuce, endive, radicchio, chicory, kale, collards, hibiscus and certain flowers. It’s best to budget about $1 per day to feed. This type of animal is a great animal for beginners since they tend to be social and are very easy to maintain. However, keep in mind that if properly taken care of, they can live more than 30 years, a much higher average than most other pets. You are making a long term commitment. If you catch your turtle in the wild, it is imperative you bring it to the vet to make sure that it is healthy and has no signs of stress or health issues. You also need to give the tortoise time to acclimate to its new surroundings since getting used to a new home in captivity may cause underlying problems to surface. Russian tortoises can be housed together, but never house different species together. Common health problems, as per Petco, can include respiratory disease, ticks, gastrointestinal disease or a vitamin deficiency due to insufficient UVB lighting and/or its diet. See if there’s a tortoise rescue in your area offering older tortoises for sale. This is a great way to help a local organization and offer a tortise who truly needs a home.